CGCGCEb, CGCFAD, DADGAD, EADEAD, DGDGBbD and FGDGCD. Model 314ce. It's equipped with the Fishman Prefix Plus onboard electronics system. 2001 Taylor Sitka Spruce/Indian Rosewood Grand Auditorium Model 814ce. It's equipped with a L.R. Baggs iMix Onboard Stereo electronics system. 2002 Taylor all Koa 12 string, Model K65ce. It is equipped with a L.R. Baggs iMix Onboard Stereo electronics system. 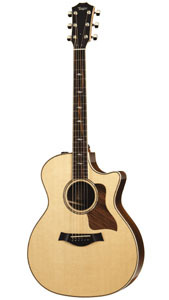 2015 Taylor Sitka Spruce/Rosewood Model 814ce ES2. It is equipped with the Taylor ES2 electronics system. 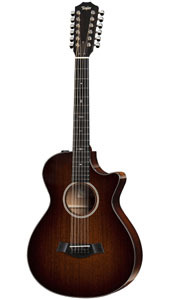 2016 Taylor Mahogany Model 562ce ES2. It's equipped with the Taylor ES2 electronics system. It may seem very strange nowadays, but in Ireland the guitar is not considered a traditional musical instrument, and even if many guitar players play Celtic music, this music has not been completely absorbed in the world of the six strings (1). The guitar is an instrument older than the instruments typical of the Celtic tradition, such as the uilleann pipes, the Celtic harp, the whistle and the fiddle: it's instead the most important instrument of Spanish traditional music, and its ancestor, called the "oud" (in Arabic language "al'ud", and from there the word "lute") is widely played in classic and traditional music of Middle East (2). Until a few decades ago, the guitar was an unusual instrument in Celtic music, and this probably more for social and historical rather than musical reasons. In the years since guitar appeared in the Irish musical scene, Irish music (which had absorbed the accordion and thus evolved in its musical style) wasn't in good health. A culture in decay tends to become more conservative, and the guitar, too often connected to the rock'n'roll culture, had a strong smell of revolutionary modernism. In spite of the growing popularity of the guitar in the sixties and seventies (or maybe because of it...) the gap between guitar and Irish traditional music stood still (3). The first use of a guitar in Irish music dates to the 1930s, when some Irish musicians in the USA began recording their music with a rhythm guitar backup which, however, didn't add much to the music. Probably the most important guitar player of those years was Martin Christi whose "jazz-oriented" style can be heard on fiddler James Morison's recordings(4). Some years later, an interesting accompaniment style was developed by the guitarist Willie Johnson in the Shetland Isles. He, too, was influenced by the 78 recordings of the great American jazz guitarists Eddie Lang, Eddie Durham and Lonnie Johnson. Willie Johnson adapted their swing style to the accompaniment of the traditional fiddle music of the Shetland Isles: the resulting "Shetland swing" remains an important part of the musical tradition of these islands, and is rich in the typical elements of jazz music, i.e., syncopated rhythm and passing chords, and often rich of harmonic embellishments (5). The sound of Celtic music depends very much on the acoustic and stylistic features of its instruments; so the first (and one of the main) difficulties for the guitarist who wishes to play Celtic music is to try to maintain these musical colors and flavors. 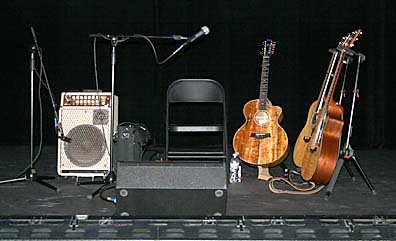 The main musicians who succeeded in maintaining these features in their approach to the guitar are Dave Graham, John Renbourn, Martin Carthy, Dave Evans, Pierre Bensusan and Duck Baker. Stefan Grossman has also played an important role, especially in the diffusion of Celtic music for guitar. His recordings, his tablature books and his videotape lessons are precious tools for every guitar player who wants become a "Celtic guitarist". Transferring Celtic music to the guitar implies several problems. The first one is that the guitarist is trying to play the parts of more than just one instrument: in other words he/she must play a melody line, a bass part and a rhythm part. In the case of some slow airs you have also to play some counterpoint, to keep their original flavor. Another particular difficulty is that the "Celtic guitar player" is trying to imitate with his/her instrument the playing techniques typical of other instruments; for this reason, the first thing to do is to listen carefully to the sound of these instruments in their own context. After all, much of what we hear today comes, more or less directly, from direct listening! So, after many and many hours of careful listening to groups like Chieftains, De Dannan, Bothy Band and so on, probably the guitar player will succeed in developing a playing technique that will respect the musical styles of Celtic music. For the same reason it's very important for "live" listening, to catch the "drive" of this particular form of music and to transfer it in his/her own playing technique. If we listen carefully to this music, we'll notice quickly that the main keys are D and G: this is why instruments like the tin whistle, the Celtic harp and the uilleann pipes are "modal" instruments, and their playing key is somehow fixed: you can play only in few keys, and it's almost impossible to play in other keys. The main strategy for the Celtic guitarist is to make the guitar a modal instrument. The famous DADGAD tuning is used by many Celtic-oriented guitarists and supports the keys of D, G and A. This tuning dates to the Sixties, and one of the first to use it was Dave Graham. A variation of this tuning is obtained lowering the fifth and sixth string one more tone: it's the so called "low-C tuning": CGDGAD, often used by Dave Evans and El McMeen. Another possibility is to lower the sixth string to D ("dropped D tuning"): this solution allows a richer sound in the key of D. Standard tuning (EADGBE) is possible, but makes life more difficult (...musically speaking...) to Celtic-oriented guitarists: for this reason most of them use alternate tunings, and anyway most of Celtic music for guitar today is not played in standard tuning. Obviously there are many other possibilities: personally I prefer EADEAE (I learned it from the wonderful album "The Complete Guitarist" by Dave Graham...) and DGDGBE (often used by the great John Renbourn): both of them are particularly useful to render the drone typical of the pipes, by just picking the "open" low strings. The open tunings: DGDGBD; CGCGCE and DADF#AD have been often used with great results; sometimes, the "minor" tunings are used (for example, in G: DGDGBbD). Martin Carthy often used the DADEAE, that allows playing in D major and D minor, A major and minor, E minor and G major. Martin Carthy himself has then modified this tuning in DADEAB and CGCDGA, but only in few tunes. The use of alternate tunings obviously is not mandatory in Celtic fingerstyle guitar: the great Duck Baker has always been reluctant in leaving the standard tuning, and nevertheless he gave us some of the most beautiful arrangements for Celtic guitar. Finally, the adoption of all these alternate tunings can be helpful, but requires an open mind, since the guitarist has to learn new positions and the fretboard becomes unfamiliar. The use of a particular tuning depends a lot on the personal taste and sensibility of each guitarist. The harpist and composer Turlough O'Carolan (1670-1738) lived in a particularly difficult period of the history of Ireland: in the years of his life the old Gaelic world suffered the invasion by the new Anglo-Irish culture, a consequence of the Cromwell wars. The harp style of Carolan, a mix of ancient tradition, old songs and popular dances with the influences of the Italian Barocco (Corelli, Geminiani were popular at that time in high classes in Ireland), was too eclectic and modern for the harpists of that age. More, he wasn't very good as harpist, since he learned this instrument not very early, after he had lost his sight. Also, he wasn't very good at writing the poetical texts that accompanied his compositions. There was something instead that made him very popular: his great disposition for melodic invention: he composed real gems that gave him an everlasting immortality. Most of his compositions were dedicated to his friends or "patrons": so for example, "Doctor John Stafford" is about a receipt by my colleague Dr. Stafford who, after visiting O'Carolan, allowed him to drink again his beloved whiskey, against the opinion of another doctor (...mmmm, in my profession I've already heard something like that...and anyway this confirms my long time opinion: Medicine is not an exact science...; but maybe it's better if we return to Mr. O'Carolan...). Among the most famous compositions, "Sheebeg & Sheemore" (one of the first ones by O'Carolan) talks about a legendary battle between the inhabitants of two fairy hills, and "Farewell to Music", composed few days before his death at the Castle of Mrs. McDermott Roe. The music of O'Carolan survived in the centuries just thanks to a direct transmission from musician to musician, and only the melody lines were transmitted: we don't know anything about bass parts, harmonizations and/or embellishments. Probably the simplest arrangements are the most "authentic". The reason why I'm talking about Turlough O'Carolan in this page, devoted to the Celtic fingerstyle guitar is because there isn't a Celtic guitarist who hasn't played some of the wonderful compositions of the blind harper: many of his tunes have been re-arranged in several guitar versions, and many tablatures exist; often these arrangements are not very difficult to play but the quality of the music makes them very impressive to the audience. Dr. Alfredo de Pietra is a medical practitioner in Palermo, Italy and also contributes monthly articles on Celtic guitarists to the Italian newsstand publication "Keltika".